The beautiful Rolling Greens Home + Garden and nursery hosted a lovely event with blogger and design junkie Victoria Smith to launch the store’s new arrangement bar. Bloggers and social influencers alike were invited to the intimate event in West Hollywood on Friday night to check out the newest addition to the store, as well as getting first hand experience in arranging your own succulent! The evening started off with Kambucha cocktails, small bites, and a tour of the store, which was led by our amazing teacher for the night Ernesto Lopez. If you are a plant and design lover, especially if your style leans towards “boho chic,” you must check this place out. The store is stunning, and each area of the store reflects a specific room in a home, ie; dining room, living room, etc. The design of the store and the different rooms themselves are absolutely breathtaking and unique, everything from the lighting fixtures from around the world to little knick knacks such as books, candles, and more to make your home unique. Of course we can’t forget that Rolling Greens is a nursery as well, that specializes in orchids and succulents. After taking the tour of the store, we were introduced to their new arrangement bar, which we were able to experience first hand. The arrangement bar gives shoppers the opportunity to create their own succulent or orchid arrangement, all you have to do is find what you like and they will make it beautiful! However for this event, we were taught how to create these arrangements ourselves, and was it ever fun. 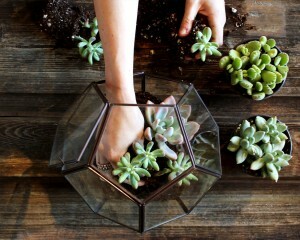 Each attendee was given a bowl with sand, stones, and three succulents. We learned how to pot the succulents, layer the sand, and even create some cool designs with popsicle sticks, who knew! Things might have gotten a little dirty, but it was definitely worth it, and was just a fun experience for everyone involved. We each left with our own unique succulent, as well as a great deal of knowledge about caring for these special plants. Rolling Greens is by far one of the most unique and beautiful home and garden stores in Los Angeles, and the arrangement bar itself is worth the trip.